Contrary to popular belief, Taste Test was not conceived as a way to torture the business development department’s Dave Chang, or to hand him fleeting fame as an Internet Eating Sensation. It also wasn’t conceived as a sort of Fear Factor-styled dare, though we’ve had plenty of those in the past, including last week’s blockbuster, Chicken In A Can. So don’t be shocked that this week’s Taste Test is a candy bar, plain and simple—though a relatively new candy bar. And a limited-edition candy bar at that. Get pumped! 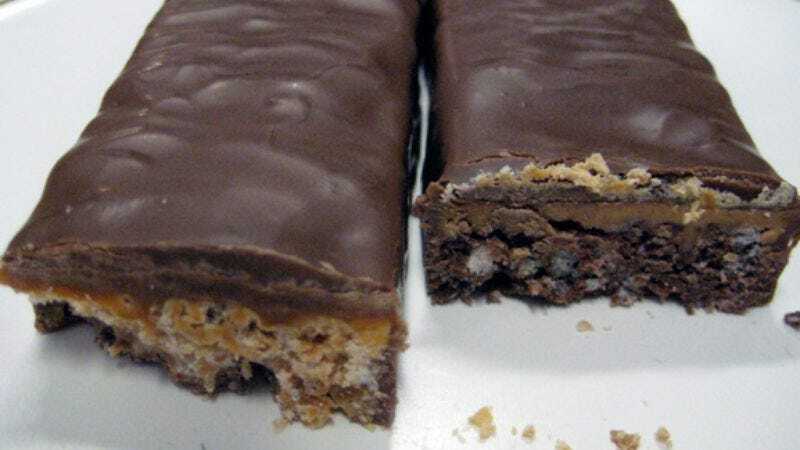 You’ve never eaten a Hershey’s Thingamajig, have you? You didn’t even know it existed! And if you saw it, you probably thought it was just a Whatchamacallit rip-off—and who eats those, anyway? You’d be wrong, though—it’s more curious than that. Both Whatchamacallit and Thingamajig are made by Hershey’s, and they have slightly different ingredients. We thought it’d be a good idea to test them head-to-head, in a cage match of crispiness. The taste: There’s a very clear difference in taste—caramel vs. peanut butter. And Thingamajig didn’t win this thing in a walk, like I thought it would. It didn’t win this thing at all, really. Vast nostalgic memories of Whatchamacallit came flooding back, and the chewy, slightly dry bar was something of a hit. The crisp inside is peanut-butter flavored, but the overwhelming taste and texture is caramel. The chocolate (ahem, “chocolatey coating”) seems almost like an afterthought, and it isn’t a huge part of the experience. As for Thingamajig, it’s similar, though much softer, and the cocoa flavor in the crisps is far more evident than the peanut butter in its counterpart. It’s a nice balance with the actual peanut butter in this one—it tastes a little like those Hershey’s clusters that came out fairly recently. Strangely, though, there is no information on the Internet to be had about Hershey’s Thingamajig. Have we been the victims of an elaborate ruse perpetrated by the Walgreen’s on Clark Street? Will those of us who enjoyed Thingamajig ever be able to find one again? (Or, worse, was this some 3-year-old box of “limited-edition” candy bars that someone dug out of the basement? Nah, too fresh-tasting for that…) I guess it will have to remain a mystery. Where to buy it: We found the Thingamajig at Walgreen’s, and you can find a Whatchamacallit just about anywhere, you turkey. Bonus round: If you’re very brave and not at work, do a Google image search on the word “thingamajig.” Check out the very first result. You have been warned. It couldn’t be more NSFW.